Good, better, best never let it rest; until your good is better and your better is best. We equip our children with the life skills needed to gain self-confidence, make intelligent choices, but especially to set worthy goals throughout their lives. Adults are given the emphasis to pursue a lifestyle choice that promotes health, fitness, and longevity. At EKJJ, we teach Classical Okinawan Karate and Pedro Sauer Gracie Jiu Jitsu. We build strong bodies and strong minds one student at a time. Along with learning karate, students will learn new things about themselves. Sensei Rachel has been teaching karate since 1995 and currently holds the rank of Yon Dan, or 4th degree black belt. 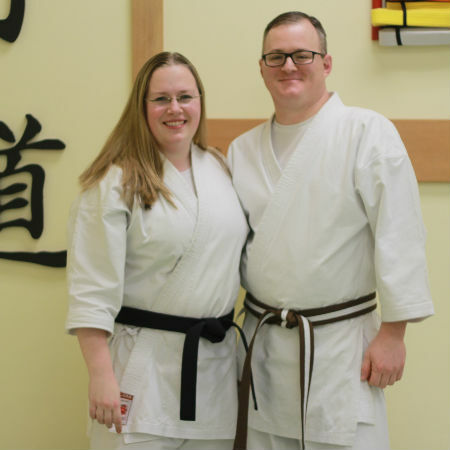 In June 2016, she was given the teaching title of Fuku Shihan, which translates to Assistant Professor, by the leader of Shudokan Karate-do Hanshi Morris Mack. Sensei Rachel also has her master’s degree in counseling psychology and worked as a mental health counselor before devoting herself full time to the dojo. Andy has been training with Sensei Rachel since 2014 after years of prodding. Andy served in the Marine Corps for 5 years before joining Rachel at Washington State University where he excelled in the Hospitality business management program. 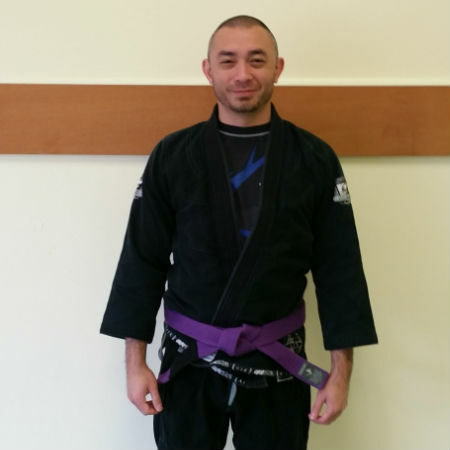 He has worked in the restaurant and hotel industry and provides the other half of a wonderful ownership team for Evergreen Karate and Jiu Jitsu. His background in business management made the dojo purchase in 2017 an easy decision for the Lyon family. Bryan is a black belt under Jits Master Pedro Sauer and runs the adult program at EKJJ. He is among a handful of instructors worldwide who received all of his belts, including his black belt, from eight degree red and black belt Master Pedro Sauer. Master Sauer received his black belt directly from the founder of Gracie Jiu-Jitsu, Helio Gracie and his son Rickson. In addition to Gracie Jiu-Jitsu, Bryan was a state and regional champion gymnast in his teens, and was a pro-wrestler for nearly 20 years. Prior to teaching jiu-jitsu he coached gymnastics for twenty years at both Leading Edge and Cascade Elite Gymnastics. When he is not running class, Bryan works as a nationally-syndicated radio show host for “Wrestling Observer Live” on Sirius Satellite Radio and the Sports Byline USA Radio Network. several state and regional championships. 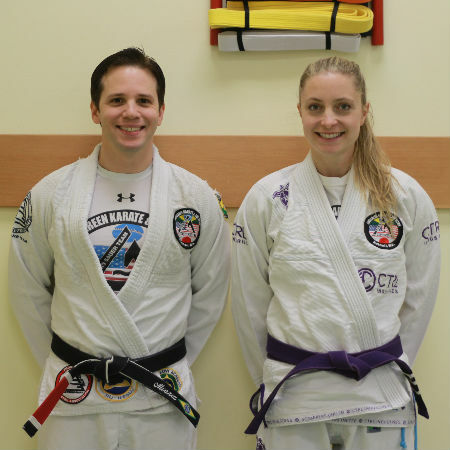 She coached gymnastics for three years before coming to Evergreen Karate and Jiu-Jitsu and holds a Masters Degree from the School of Marine and Environmental Affairs at the University of Washington. Outside of jiu-jitsu she currently runs her own 501(c)3 non-profit, Whale Scout. Mike is back training and teaching at Evergreen Karate and we couldn’t be more thrilled to have him! His extensive experience in tournament competition is a huge asset to our school. Sensei Mike works as an Industrial Engineer at Boeing and lives in Snohomish with his family. Both of his kids train in the dojo as well. 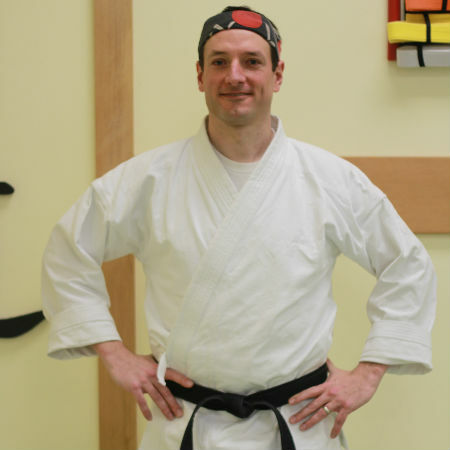 Sensei Geoff started karate in 2011 after watching his two oldest boys attend classes. It looked like a lot of fun and now he’s hooked! Now a second degree black belt, he has four children in various classes, two of which are black belts and assist him weekly. He shows amazing teaching range with teaching 4-6 year olds as well as our brown belts training for their black belt test. During the day Geoff works as a computer programmer in the finance industry. Sensei Adrian began karate under Shihan Randy Holeman at our sister Shudokan school Karate West in Issaquah, WA. Under his guidance she became the youngest female in school history to receive a black belt. Alongside her mother (a second degree black belt) she began teaching at age 12, later graduating to lead instructor of her own classes. 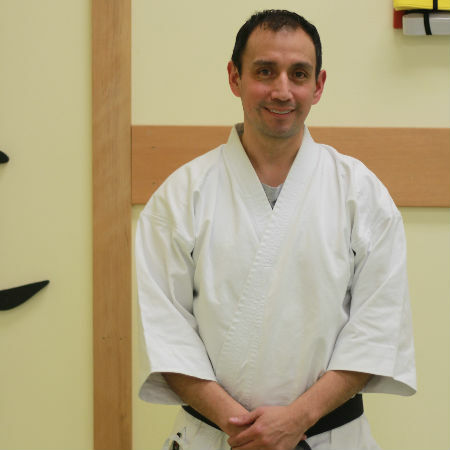 Sensei Adrian joined us at Evergreen Karate and Jiu Jitsu in January 2018 and has been a fantastic addition. Adrian loves teaching karate because it’s so much more than self-defense lessons; students gain life lessons that stay with them forever. As a mother of 3, Sensei Adrian recognizes how these life lessons and self-defense learned in karate can be applied to everyday life. She enjoys preparing her students to be confident and respectful to all. 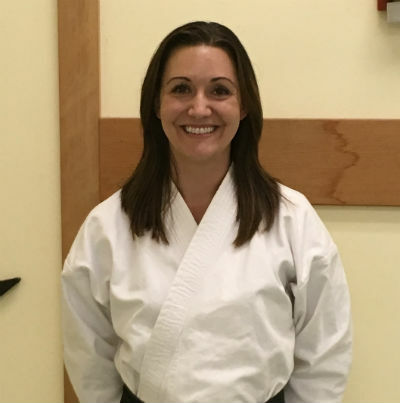 Sensei Adrian lives in Lynnwood and loves spending time with her husband and three young daughters. She also enjoys gardening and painting. 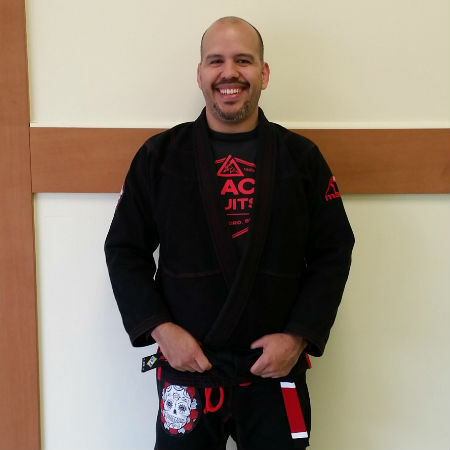 Trinidad “Trino” started training in Brazilian Jiu Jitsu in 2006. He has trained with Pedro Sauer, Relson Gracie, Rener Gracie, Ryron Gracie, Rylan Lizares, and Robert Lovi. His day job is medical coding. His favorite part of teaching is when you can literally see the light bulb in someone’s head light up showing him that they hit that moment when they understand a technique. Variety of membership packages provide options for every need!